Think, Know, Prove is an occasional Friday feature, where a topic with both mystery and importance is posted for community discussion. The title is a shortened version of the Investigative Mantra: What do we think, what do we know, what can we prove? and everything from wild speculation to resource referencing fact is welcome here. So a while back, over a holiday break, I put together some numbers to try to put the lie to some suspicions that I held about Reinvention and the growth in degrees. I put it all together and then put it all up in one post and, frankly, think that it was so many numbers and so many charts that only a handful of people actually read through any of it (thanks for being one, Jen Asimow, and John Hader, and Mike Davis!). When I did it, I found that my guess about the types of degrees that were driving the increase was a little bit right and a little bit wrong. 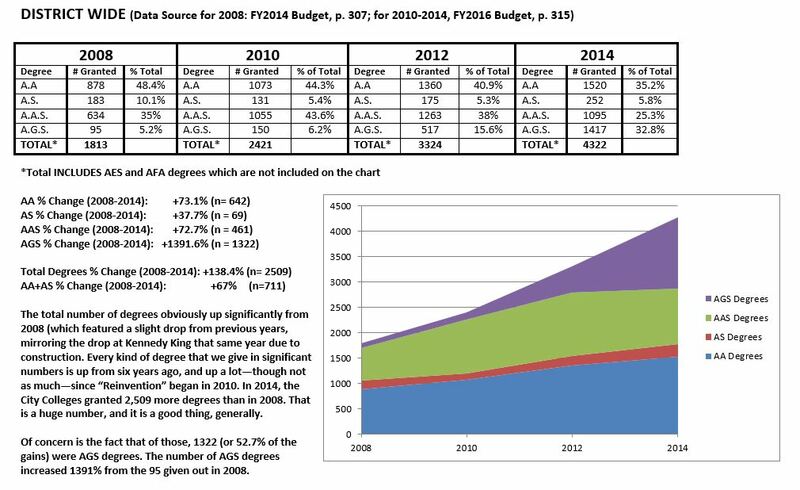 I had guessed that the number of Associates in Arts (A.A.) and Associates in Science (A.S.) degrees might have gone up slightly, but that the vast majority would be the result of increases in Associates in General Studies (A.G.S. degrees). What’s the difference? Well, if you know, you can skip down. But if you don’t, there’s a big difference. A.A., and A.S. degrees are our traditional transfer degrees. Students completing those degrees will have completed the “General Education Core Curriculum,” including English 101, 102, Speech, 3 Humanities, 3 Social Sciences, a Math, and Two Sciences (one with a lab). It’s true that the world of Higher Ed has changed a lot in recent years so that not all of those courses are requirements of Bachelors degrees at all (even most) schools these days, but it also remains true that students who complete those classes, especially those who were underserved or mis-served by their high schools benefit from the learning. Meanwhile, A.G.S. degrees are different in that they require a few less hours (60 instead of 62), but also in that they have much less in the way of requirements. Students only have to take English 101 (not 102 or speech), students have to take one humanities, not three, one science instead of two (and no lab is required), etc. In my early years at HWC, students were always steered toward the A.A or A.S., rather than toward the A.G.S. degree. It was a degree for low ambitions or low achievers, generally. There were, of course, exceptions, but typically students who got that degree were done with their schooling. When I looked at the degree numbers, though, I was surprised at (and happy to find) the size of the increases in our A.A. and A.S. numbers, but they were there–significant and real. Unfortunately, I also found a rapid and troubling increase in the number of A.G.S. degrees granted, and I worried that we were passing students through a set of classes and handing them a degree that said they were ready to transfer when the degree itself did little (or not enough) to actually prepare students for the reality of their upper level classes. I worried that our students would be hurt by their lack of preparation due to the reduced rigors of the degree requirements (compared to the A.A./A.S.) and that our school reputation would be hurt by having a large pool of under-educated graduates walking around with degrees from Harold Washington, hurting our mission and all of our students who walked out with a “real” General Education degree. At the time I didn’t even know about the fact that students receiving a degree from us could no longer use financial aid with us, meaning that a student who receives an A.G.S. degree and then upon transferring finds out they need English 102 or a Fine Arts class or whatever is then paying out-of-pocket for everything they take with us because they have graduated. But now I do, and so I also worry about the students who have to pay a lot of money with us or a WHOLE lot of money at their transfer institution for a class that they could have taken with us on financial aid if they’d been put on a different degree track. Anyway, what do those numbers look like now? Well, I’m not going to make the same mistake of pushing everything at you all at once. Oh, no. Working like Plato, I’m going to let you see the big picture first and then take you through the individual cases one by one. So, here is the data for the district. What do you think? What do you know? What can you prove? Thanks for this PhiloDave- I think many of us are worried/concerned about many of the same issues you raise. It is admirable that students achieve degrees, regardless of the degree, as it is a huge amount of work and dedication that gets them there. The bigger concern that most of us have is about the students who are receiving the AGS degree although they left the city colleges years ago. I know several students who received messages through the mail that they were awarded an AGS degree, some having left the city colleges system in the 90s (not to mention a couple whose degree says “Loop College” – you can do the math on that one.) Perhaps this is righting some wrong, however, I think this is (was) a brilliant way of milking the numbers. Did you know they have weekly “completion” meetings where they actually discuss these kinds of tactics? In our field, an AGS is neither a transfer degree nor a vocational degree. Students who default to an AGS cannot use this degree to keep their jobs, so they are forced to take additional credits that they may not need to actually complete the Advanced Certificate or the AAS. I think that these practices are amoral. I know that bringing these issues to light is our moral and ethical responsibility, and once again, as usual, I can’t prove anything. It would also be interesting to see these numbers normalized or adjusted for population growth or probably growth in enrollment. Anecdotally, I thought that HWC at least had family healthy growth in enrollment over the past few years, so if we are enrolling more students, we had better be awarding more degrees (preferably of the AA/AS variety).